The Soft Coated Wheaten Terrier, sometimes spelled “Softcoated Wheaten Terrier,” is a compact and squarely proportioned dog. The moderately long head is rectangular in appearance and in proportion with the body. The strong muzzle is relatively short compared to the skull and has a defined stop. The black nose is large for the size of the dog. The teeth meet in a scissors bite and the lips are black. The wide-set eyes are almond shaped and come in a reddish brown to a medium brown color. Light or yellow eye color can occur but is a breed fault in the written standard. The V-shaped ears fold forward and are level with the skull. The medium-length neck gradually widens into the body. The back is straight, forming a level topline. The front legs are straight and the paws are compact and round with black toenails. The high-set tail is either docked or kept natural. Note: docking tails is illegal in most parts of Europe. Dewclaws are usually removed. The single, wavy coat comes in shades of wheaten. 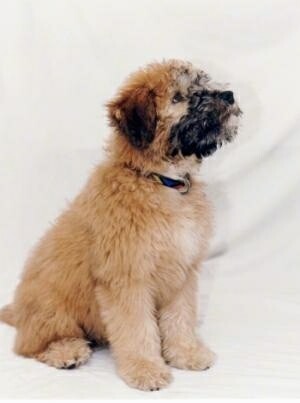 Puppies are born dark brown and lighten to the final adult wheaten color by age two. There are two coat varieties, the American and the Irish. The Irish coat tends to be thinner and silkier. The Soft Coated Wheaten Terrier is strong, agile and well-coordinated. It is a happy, playful, spirited and friendly terrier. Alert, it makes a great watchdog and barks at the arrival of guests. It is usually very loving with children and gets along reasonably well with other dogs. An unsocialized dog with a meek owner who does not know how and when to correct negative behaviors may end up with a dog-aggressive dog. Some of these dogs that were not raised with cats may not get along well with them. All it takes is some fast movement on the part of the cat, and the dog's instincts will take over and he will chase them. The dog needs to be corrected right before it takes off after the cat. These dogs have a puppy attitude that remains with them throughout their lives. They are sweet-tempered, docile and self-confident. This breed needs to be taught, preferably when young, but older dogs can learn what is and is not acceptable behavior. It is very intelligent, so it will generally grasp quickly what is required of it. 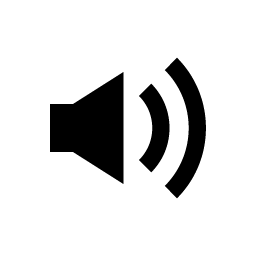 It has a straightforward nature and needs to be handled in a straightforward manner. 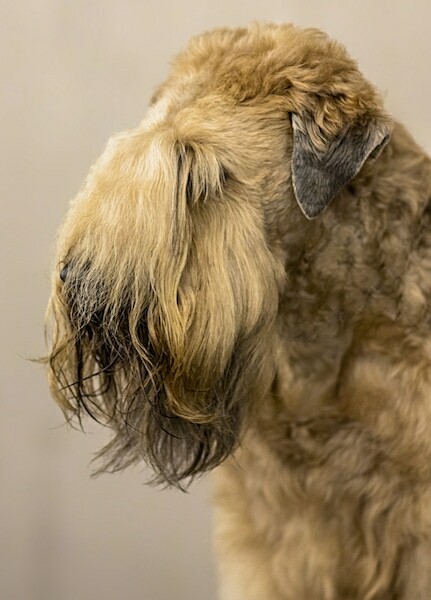 Soft Coated Wheaten Terriers bond closely with their family. They seldom bark unnecessarily. The Soft Coated Wheaten should be well socialized with other dogs while it is a young puppy, but adults can learn what is unacceptable behavior if they have an owner who properly communicates with them. In order to have a well-behaved Wheaten, you must be firm, but calm, consistent and confident with the dog. Meek owners will find the dog will easily take over the home and will be hard to control. Do not allow this dog to jump on humans. Jumping dogs are not "greeting" the human. Jumping is a respect and a dominancy issue. Prone to protein wasting disease (PLE and PLN) and flea allergies. 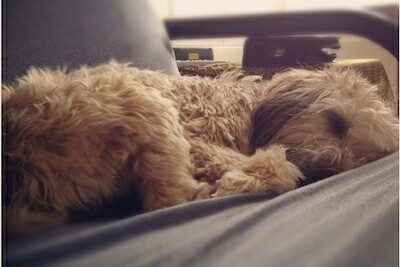 The Soft Coated Wheaten Terrier is good for apartment life. These dogs are moderately active indoors and a small yard will do. This breed does not tolerate heat very well. The Soft Coated Wheaten Terrier can get by with moderate exercise as long as it is taken for daily walks. When grooming the Soft Coated Wheaten Terrier, the object is to achieve a natural look, and brushing can make the soft coat fuzzy. So using a brush is not recommended. Instead, frequent, even daily, combing of the long, profuse coat with a medium-toothed comb is recommended to keep it free of tangles—beginning when the dog is a puppy. Clean the eyes and check the ears carefully. Bathe or dry shampoo when necessary. The Soft Coated Wheaten Terrier does not shed in the spring and fall, but loose hair should be combed out of the coat from time to time. A well-groomed dog will shed very little. This breed is good for allergy suffers. 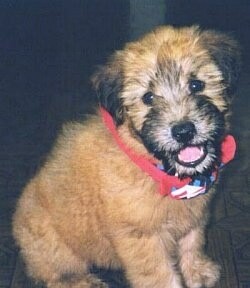 The Soft Coated Wheaten Terrier originated in Ireland and is possibly one of the oldest Irish breeds. 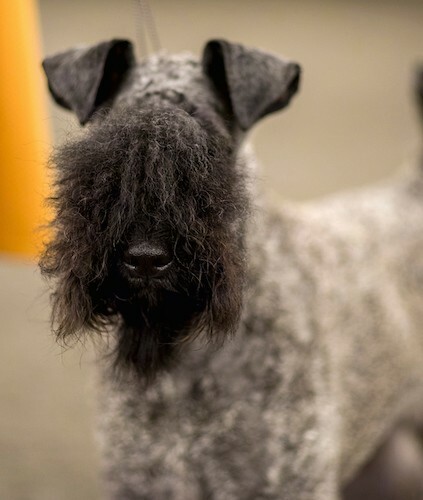 It is related to both the Kerry Blue and the Irish Terrier. It was known as the "poor man's dog," working on farms as herders, protecting the border and as a hunter of vermin and small game. 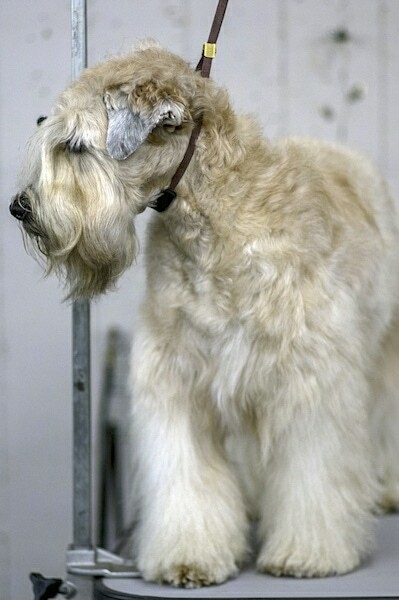 The Soft Coated Wheaten Terrier was first imported to the United States in 1946. In 1973 it was recognized by the AKC. 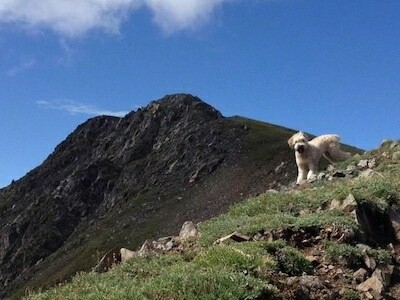 Some of the Soft Coated Wheaten Terrier's talents are hunting, watchdog, herding and ratter. 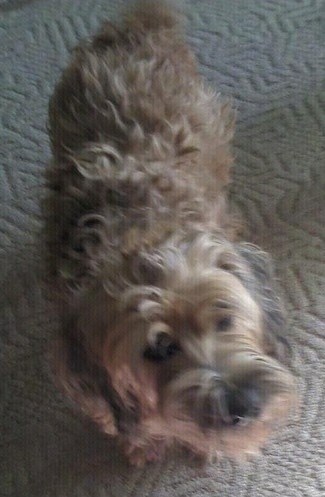 "Maggie Mae is our Soft Coated Wheaten Terrier. She's smart, witty and loves to travel. She goes on most of the car trips we take. This is a picture of her on a trip we took to the Outer Banks when she was 7 months old. She's a wonderful companion. Maggie has the Irish coat." 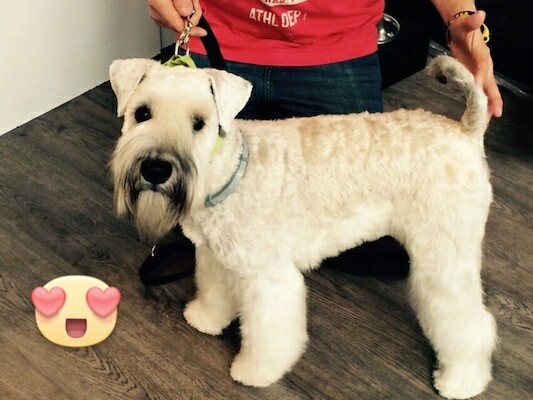 Roxy the Soft Coated Wheaten Terrier at 2 years old—"She is the sweetest dog! She loves to chase cats out of the yard and play with her "sis" Schatzie, a Miniature Dachshund." 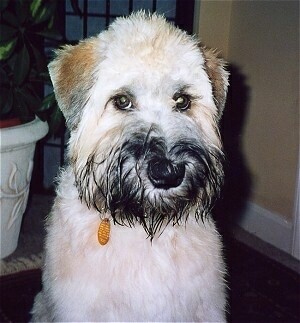 "Theodore aka: Teddy the Soft Coated Wheaten Terrier puppy at 9 months old right before his really bad hair cut." "Poor Teddy!! they shaved him! He's so embarrassed! Time to find a new groomer! At least he'll be cool for the summer! Teddy is our baby! He is very well behaved... when he wants to be. At 9 months old we were still trying to potty train him!!! Yikes!!! He is so cute that it's hard to yell at him! He gets a lot of attention! He loves to swim and go for rides in the car! But he hates getting his hair cut!!! You can see why! Joelle aka " Teddy's Mom""
Sam the Soft Coated Wheaten Terrier at 1 year old from Spain—"Sam is a very adorable, fun and sweet doggy." 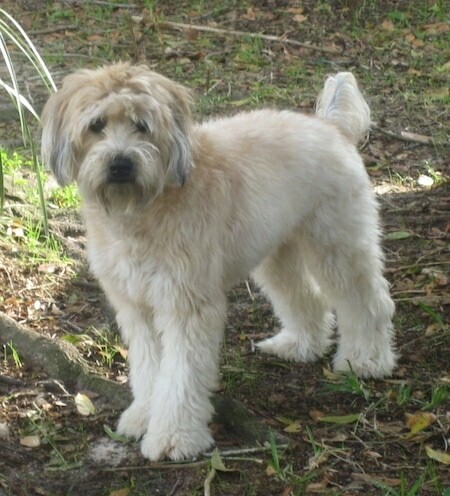 Roam the Soft Coated Wheaten Terrier at 8 months old—"What can I say about my Wheaten...energy level? High. I take her out or to the dog park once or twice per day for lengthy amounts of time. I socialized her at a young age and she LOVES dogs and other people. From reading information about her breed, I stopped the jumping habit quickly when she was a puppy. To accomplish this I first started rewarding unasked for good behavior. If she sat or layed down calmly without being asked, I immediately praised her and gave her affection. When I would come in the door, a firm "NO" would work to get her to stop jumping and she would quietly sit and wait for me to pet her. At least with Roam, mean, aggressive training doesn't work like calm, firm and consistent training. Potty training was somewhat frustrating as Wheatens like to test boundaries. She doesn't like being alone and will take it out on our plants if not crated when we leave the house for lengthy amounts of time. This isn't a dog for first-time dog owners. I grew up with dogs and thought I would be fine, but none of those dogs (Labs, Retrievers, Shelties) compared to her energy level. I found myself frustrated at times because the training wasn't as easy as I remembered it being. Roam isn't as "people pleasing" as a retriever. She is independent, curious and fearless. That said, this dog will love you and every member of your family unconditionally. She doesn't bark and her playful energy keeps me active. She has her quirks and is (sometimes) frustrating, but I wouldn't trade her for any dog in the world." 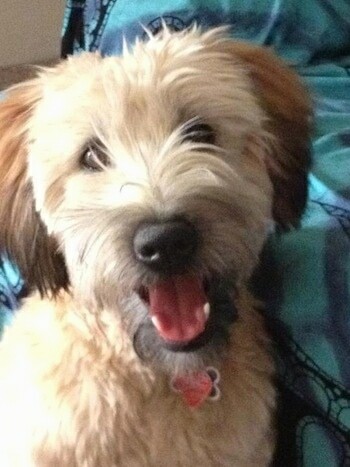 This adorable little pup is Doogan from Wood's Wheaten World! "This is Riley. 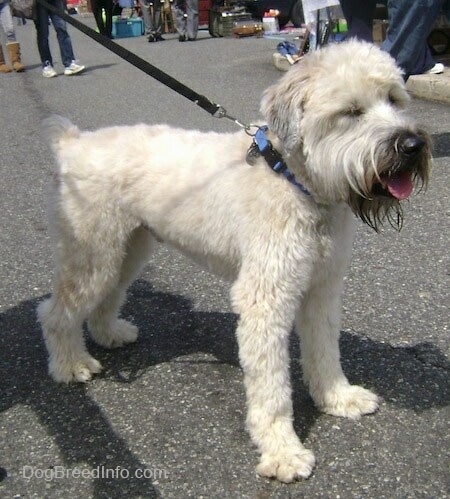 He is a Soft Coated Wheaten Terrier. He was about 3 and a half months old in this picture. He is always very entertaining!" 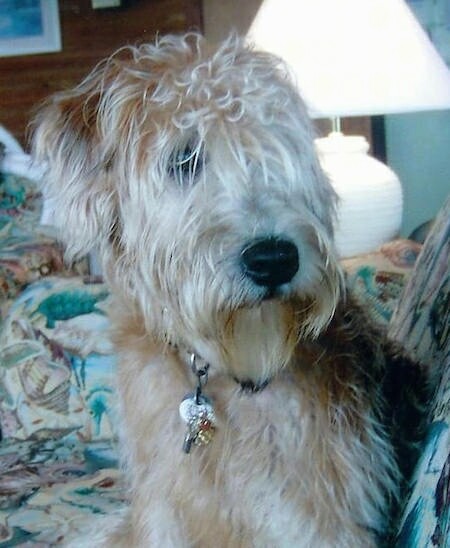 Woody the Soft Coated Wheaten Terrier at 9 years old—"Our Woody is a former therapy dog for a nursing home and is one of the sweetest, most laid-back dogs I have ever seen." 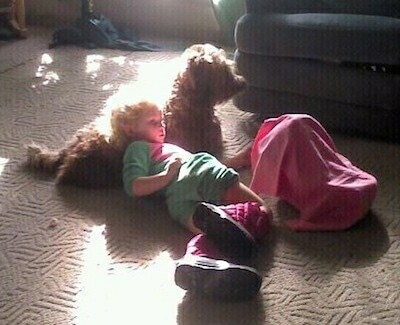 Woody the Soft Coated Wheaten Terrier at 9 years old—"What is most special is the bond he has with my daughter. From the first moment of their meeting, he and my daughter have been extremely close and he has been a vigilant companion for her. She nearly fell down the stairs once and would have if he had not jumped forward and caught her entire weight on his back. An amazing dog!"